Because I am a huge loser, I have a little box full of ticket stubs from a lot of the shows I've been to. I'm looking at one now that says I saw Fantômas on Monday, October 19, 1998. This album wasn't released until about six months after that. That may have been the first time I heard them, though I bet I had heard some stuff online before that. I remember being surprised at the wackiness of it all, but not shocked. I think I partially knew what I was getting into. Anyway. After the breakup of FNM, Mike Patton was ready to set out on his own in a big way. He started a label (Ipecac Records), and quickly put together a "supergroup" to help him play the new material he had been writing. After recruiting King Buzzo from the Melvins, Trevor Dunn from Mr. Bungle, and Dave Lombardo from Slayer (we were all a little taken aback by that one), he was ready to make some sense of all the noises he was hearing in his head. We were ready for whatever he had to offer, but we couldn't have predicted what he had in store. 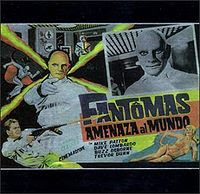 Fantômas is not the sort of band you listen to when you're sitting around with friends. It's more like something you would listen to while lifting weights after drinking a pot of coffee. It's spastic, disjointed, loud, and often confusing. Seeing it live is really something to behold. Would I like it if it wasn't Mike Patton? I would like to say yes, but that's probably a lie. He's the only one who could make these noises and keep them interesting. There are 30 tracks (or "Pages," as they're called here) on this disc, and though a few are of what some would consider a "standard" song length, most of them are around a minute long or less. It's pure chaos, and parts of it are straight up awesome. Parts of it are tedious. It's an experience. If you ever want anyone out of your house, this is the album to put on. I never loved this CD as much as I felt like I should, nor the band for that matter. I think it is a personnel matter. Would I enjoy this if it was by random people? Sure, I love Spazz don't I? But with a supergroup like this I think I want something more. That being said this one rarely gets into the rotation anymore.